Ryan Guy is definitely going the extra mile to participate in Concordia University Wisconsin’s graduation ceremony on Saturday, May 14. Starting on what was the equivalent of Wednesday, May 11, in Wisconsin, the 23-year-old Oshkosh native spent approximately 17 hours en route from South Korea to Wisconsin and will on Sunday, May 15, board a plane to make the return trip to Seoul. But not before he receives his diploma. Guy, who is slated to receive a Bachelor of Science degree in Information Technology, will walk the stage in the R. John Buuck Field House alongside CUW’s 540 other undergraduates. His journey to the stage required several thousand extra miles than most, but Guy says the trip was worth it because it means he won’t have to delay graduating until December. 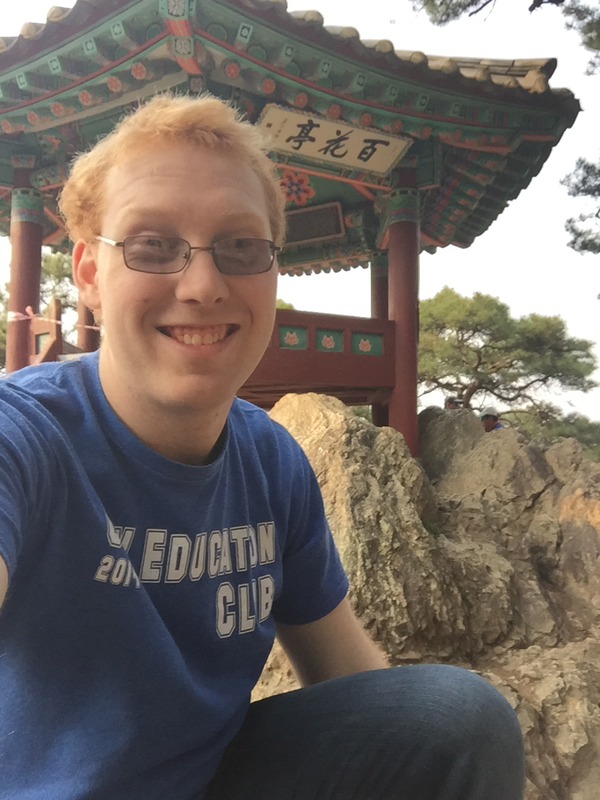 For the past nearly three months, Guy has been taking advantage of one of CUW’s sponsored study abroad programs in South Korea through International Studies Abroad. He booked his ticket home after learning that, in order to graduate in May, he would need to present his Senior Project, a requirement for graduation, in person on CUW’s campus. The problem was, the academic semester in Seoul, which doesn’t wrap up until June 21, didn’t align with Concordia’s. Guy said he began praying as soon as his semester began that the Lord would present a flight that would fit within his budget, some of which came from a study abroad scholarship through CUW. For months he watched as plane tickets remained well over his price range and then, in March, prices started to drop. For his efforts to journey home, not only will Guy reap the benefit of receiving a diploma on schedule, he’ll get to reunite for a short period with classmates and friends. He said he’s especially excited to celebrate a milestone with the Bethesda College students, whom he worked with last semester and all of last year. Read more about the first group of Bethesda College graduates here. It will be slightly bittersweet to see family, says Guy, since he’ll have to say goodbye to them again after just a short period. He’s happy, though, that he’ll have his mother, grandparents and godparents in attendance on Saturday, as well as one other special person in heaven—his father, who passed away from a heart attack in 2007. “I know he is smiling proud that his son has completed college,” Guy wrote in an email. Despite the fact that it meant an extra trip to the U.S. and back, Guy says he’s thankful for his study abroad opportunity. It’s that faith that has seen him through navigating a semester in a foreign country and finding his way to the graduation stage. Guy says he’s also relying on God to guide him through his next steps after returning from South Korea. He takes comfort in the Bible passage Jeremiah 29:11.